ARDGLASS today is one of the leading fishing ports on the east coast of Down and has a very interesting historical past. A glipse of Ardglass from a sketch in the distant past. And later in June there will be a week-long village celebration to mark this key date in Ardglass’ history. Local historian Michael Howland was approached by the village harbourmaster John Smyth to answer the question, when did the harbour come into prominence. The present fishing fleet of 38 prawn and crab boats is a fine site but back in 1210 when the Normans were moving into Ireland, Ardglass was then an attractive and strategic port as it was the only completely deep water berth between Howth near Dublin and Belfast. William Ogilvie was the founder of the modern harbour in Ardglass. Michael Howland said: “In 1210, Ardglass came to the fore when King John hunted down the De Lacy brothers Walter and Hugh for harbouring William Braose, a knight from Sussex who had fallen foul of the king. 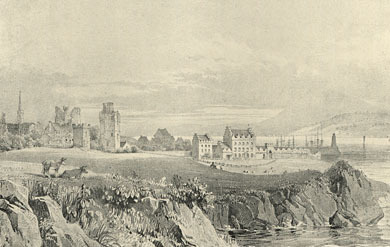 On 12 July that year King John stayed at ‘Castrun Jordani de Sackville, Jordan’s Castle in Ardglass. “The harbour itself was in use through the Medieval period and in the summer months it was a secure haven, being safeguarded by large rocks. The idea of a proper harbour did nor really emerge until the 1800’s when a a Scottish gentleman became the founder of Ardglass as we know it today. William Ogilvie (1742-1832) was a tutor to the household of James Fitzgerald, the first Duke of Leinster, and the highest ranking peer of 1770’s Ireland. “When the Duke died, Ogilvie married his wife, the Dowager Duchess Emilia. his proved to be a scandal of the time and in 1774 the Duches and family moved to France to live for six years. Among the children was Lord Edward Fitzgerald who would become a celebrated sea captain under Admiral Collingwood. He was a military leader with the United Irishmen and was bequeathed the Ardglass estate from his grand-mother Lady Mary O’Brien, Countess of Kildare in 1785. “Fitzgerald then became Baron Lecale but after the death of his son in the navy and his wife after that, he sold the estate to William Ogilvie for £26.000. “Ogilvie soon planned the reconstruction if Ardglass and within six months he commissioned the famous engineer John Rennie to draw up plans for the harbour. He set about transforming Ardglass with huge enthusiasm and proved to be a natural entrepreneur. He planned a new pier, set out new streets, constructed a schoolhouse and built a hotel along with some commodious lodging houses for the accomodation of visitors. “Sea baths were also built at Luke’s Port for salubrious bathing and the larger baths included hot and cold water and vapour baths. It soon became one of the most fashionable places to visit and this was the real beginning of the Ardglass tourist trade. This attractive village now was in a position to do trade with other main centres on a grander scale. “Rennie proposed to build a pier on the west side of the bay and covering around at least six acres and drawing seventeen feet of water. He estimated the cost of the works to be £31,548. Work on the harbour began in 1810 to the delight of the local customs and postal authorities. An Act of Parliament was passed in 1813 that “the pier was in the progress of building”. In 1813, a captain Bernard Hughes, master of the Clipper, wrote in 1853 that a packet (a ship carrying passengers and cargo) was running between Peel in the Isle of Man and Ardglass. So the modern harbour of Ardglass was founded as we know it today,” added Michael Howland.